Restaurant Location – Finally Revealed! You’ve heard the hearsay amidst the buzz, but it’s finally time to let you in on our big secret. 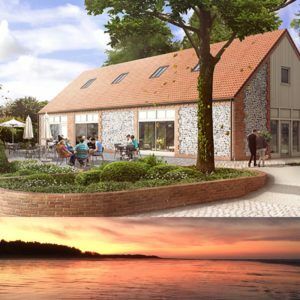 We couldn't be more excited to tell you that in early March 2018, our restaurant, Socius, will open it's doors in it's new home of Burnham Market! We will be located in one of the amazing new Foundry Place retail units, adjacent to Burnham Market’s new 186 space car park. Our ethos is simple: to create a memorable food and drink experience in a completely relaxed environment. That’s why the restaurant will have a very sociable atmosphere, offering locally sourced produce in dishes which change to reflect the seasons. And the best part about it? You can choose exactly how you want to dine, as the food will be served on small plates – as a modern British take on tapas. Which is exactly why we chose the name 'Socius': a Latin adjective for sharing and joining in - nothing could describe our dining experience better. There are so many exciting things that we can't wait to share with you. Guests will be able see the chefs at work and watch the genius of their food preparation and plating as our kitchen will be entirely open. That means no walls, and no hiding space. And for those warmer days, our al fresco south-facing terrace will offer summer dining with a view. For now, that’s all that we can reveal: but we can tell you that Socius is revolutionising the dessert experience, and you won’t want to miss it! Socius will be open Wednesday – Saturday for lunch and dinner, and ‘Social Sunday’ will offer a special family-style Sunday lunch. With the option of ordering whole joints for larger tables and chef carving table-side, Sundays have never looked so good! Our Socius-style brunch will feature on weekends, with local Grey-Seal coffee and a few brunch-style cocktails. And in partnership with Rob from CH Wine Merchants, we've been working hard to create a bespoke wine list. You can expect well-known wines, and also those outside the traditional areas and grape varietals. We will also be showcasing local brewers and spirit producers from Norfolk’s fine county, to create an exciting cocktail menu and drinks list. For the new opening, we are also going to be expanding our existing Socius team. We're looking for passionate individuals with a great personality, attitude and willingness to learn. It doesn’t matter whether you’re new to the industry or if you’ve got a wealth of experience: we’d love to hear from you. If you are interested in a role within the restaurant or know someone that is, please email us at info@sociusnorfolk.co.uk for more information. We can't wait to welcome you into Socius!! Good luck with the plans. As a local resident in BM, can’t wait to see you open your doors! Particularly looking forward to the brunch options.